Welcome to the Northwest Women’s Pool Association (NWPA), the NAPT-sanctioned regional tour for the Pacific Northwest. Though this tour prepares women amateur pool players for the pro ranks, women of all skill levels are encouraged to participate. 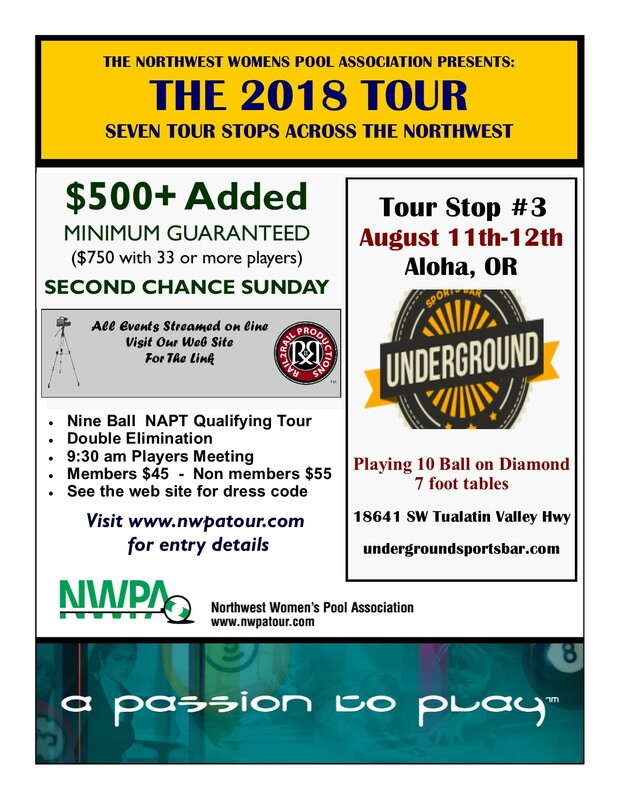 Congratulations to Liz Cole for winning the second NWPA Tour Stop in 2018 at Katz Billiards in Forest Grove, OR. For all the rankings click HERE. Also congrats to Elizabeth Jensen for taking the qualifying spot to the NAPT Summer Classic in Chicago. Tour Stops are published now. Stay tuned for the full 2018 schedule coming soon. Please join us for Stop #3 at The Underground Sports Bar in Aloha, OR. This is our first 7 foot table tournament, and will be 10 Ball. Click Rail2Rail for Live Streaming of all Tour Stops. Click Score Saloon for live scores of each active match. © 2017 Northwest Women’s Pool Association. All rights reserved.